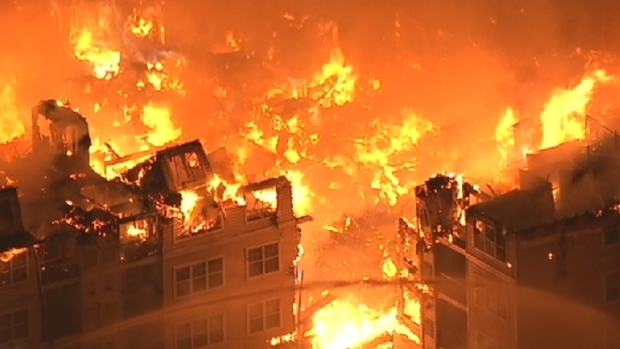 Officials and experts are questioning whether a certain type of home construction helped fuel the massive blaze that ripped through the luxury apartment complex in New Jersey, displacing hundreds of residents. The fire at Avalon on the Hudson in Edgewater spread stunningly quickly, despite the buildings being up to code and having working sprinklers. Edgewater Fire Chief Thomas Jacobson said he thought the lightweight wood construction of the complex fueled the blaze. "If it were cinderblock and cement, we wouldn’t have this problem," he said Thursday. 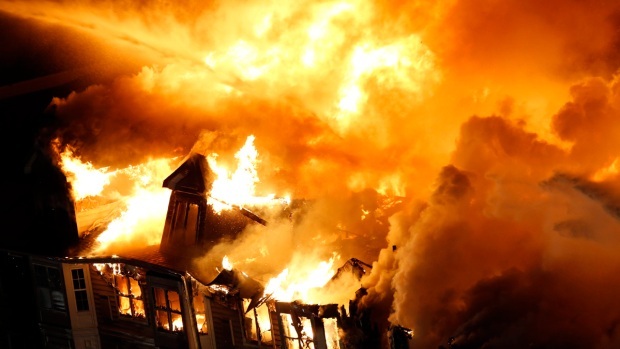 Lightweight material is often made of engineered and not solid wood, causing it to burn fast, according to Glenn Corbett, who teaches fire science at John Jay College of Criminal Justice. Despite its hazards, the materials are very common, he said. Corbett said it's likely investigators will ask whether there were draft-stopping materials or barriers in the walls and roof spaces that could have slowed the fire down. Gov. Christie said Thursday the state's Department of Community Affairs is conducting its own investigation into whether the building met all the safety codes, and if so, whether a change in code is necessary. NBC 4 New York's I-Team found that the parent company of Avalon on the Hudson, AvalonBay Communities, has a checkered history with fire safety. In 2000, while the same Edgewater complex was under construction, a fire burned everything to the ground and destroyed nine nearby homes. Later, six people who lost homes in the fire won settlements from AvalonBay. In July 2011, fire destroyed an AvalonBay apartment complex in Quincy, Massachusetts. Faulty construction and a lack of fire barriers were found to have contributed to the damage. Fire also destroyed a building at an AvalonBay complex under construction in Garden City, New York in April 2012. And in October 2012, the New York City Department of Buildings cited the company for having inadequate fire extinguishers at a complex on Manhattan’s West Side. The I-Team emailed the CEO of AvalonBay with specific questions regarding its safety history and received the following statement in response. “We continue to cooperate with the Fire Department as they complete their investigation into the cause of the fire," said CEO Sean Breslin. The company sent an additional statement from AvalonBay’s Chief Construction Officer Michael Feigin saying that "the community was built in accordance with the fire and safety codes applicable at the time." Feigin added, "The purpose of those codes is not to prevent the building from burning down, but rather to ensure that there is sufficient time and opportunity for all occupants to exit safely in the event of a fire." Wednesday night's fire at the Avalon at Edgewater complex brought back memories of a 2000 fire when the complex was under construction. Brynn Gingras reports. Edgewater’s Police Chief said Thursday evening that the cause of the fire was accidental, started by maintenance workers making plumbing repairs.